Planning a bounce back to school event, field day, fun fair, end of year party, carnival, homecoming, prom, lock-in, or a Graduation party? Bella's Bouncies is ready to make your event a huge success! 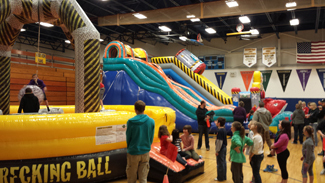 We offer one of the largest selections of Extreme Attractions, bounce houses, wet & dry slides, obstacle courses, carnival games, fun foods, and more in the Chicagoland Area. CONTACT US TODAY TO PUT TOGETHER A PACKAGE DEAL THAT WILL SAVE YOU MONEY!!! We’ll help you meet your budget and select the appropriate equipment. Attendants can be provided for your event for an additional fee. Bella's Bouncies is approvied for public events by the State of IL. We are fully insured, and proof of insurance is readily available. We currently work with several school districts in Northeast IL and Southeast WI. Call or Book Online today to get your event started!